...a selection of King-Parrots. Male King-Parrots have the reddest-looking feathers in the universe, because they've actually got a bit of Day-Glo orange mixed in there. 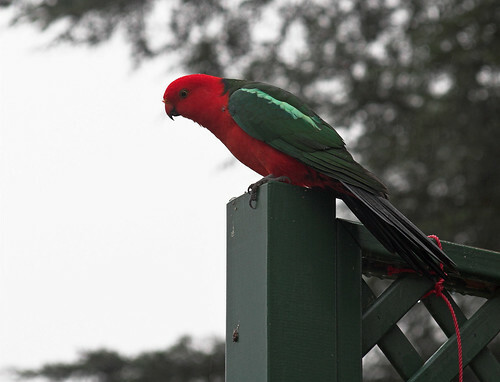 Rosellas are brightly coloured birds, but they look downright dowdy compared with King-Parrots. Fairly often, though, there is a great beating of small-to-medium-sized wings followed by a sound vaguely suggestive of pterodactyls. Because the Sulphur-cresteds have shown up. 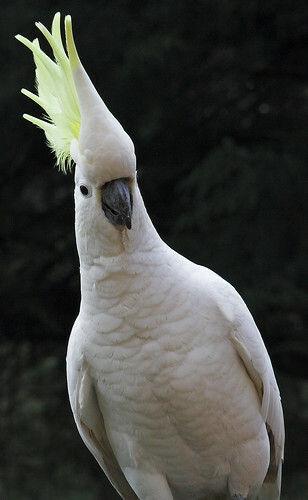 The Sulphur-crested Cockatoo is, like the smaller parrots, common pretty much everywhere on the populated Australian coast. They're still impressive buggers, though, with an average weight of more than 800 grams (Urban pigeon: 200 grams. Bald eagle: 4000 grams) and a tourist-startling screech (MP3) roughly as loud as a chainsaw. Fortunately, they only visit our little bird feeder in single-digit numbers, or they'd have dismantled the whole back of the house by now. 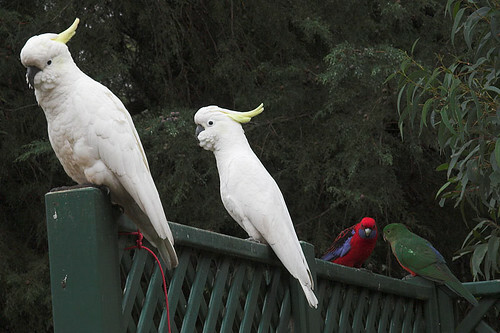 Smaller parrots (cockatoos are not technically parrots, but they're very similar) walk as if their feet are on little wheels going round and round. Sulphur-cresteds are big enough that they walk like policemen with their hands behind their backs. 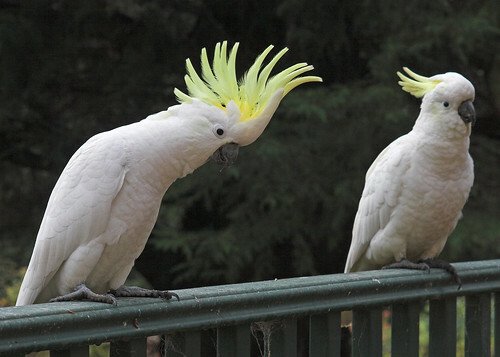 It is my theory that a Sulphur-crested Cockatoo flips up its crest whenever it has a thought. They have a lot of thoughts when they're trying to deal with the weighty issues raised by the presence of a seed bell and of a person taking dodgy photographs of them through the living room window. Sometimes they remind me of Eric Idle. When Sulphur-cresteds are a bit chilly and aren't eating, they fluff up their facial feathers and completely change their expression. Combine face-fluffing with the bendy stretchy crest-flicky stuff they do when they're staring down a human being, and you get endless entertainment. Fun Fact: Commercial seed blocks for birds - and, probably, for rodents and other such creatures - are held together with ordinary PVA glue. nice little birdies aint they? 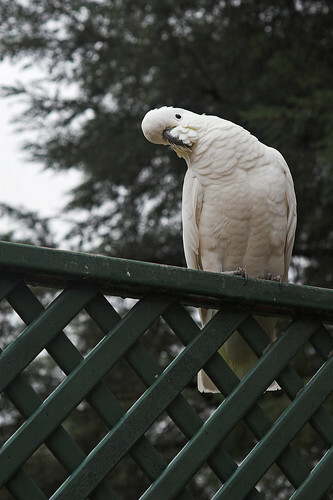 That is until you go away for a week and you come back and find the cockatoos have eaten all the railings from your deck and sills from your window frames cos they got no food. They are also very fond of starting to chew on motorcycle parts (handgrips, throttle cables and seats).A few years back i had to work on a house in wollongong that had all the cdear window frames and door sills eaten away, by their lovely cockies (they really are great birds, i mean that genuinely, they have got loads of character)cost them a heap. 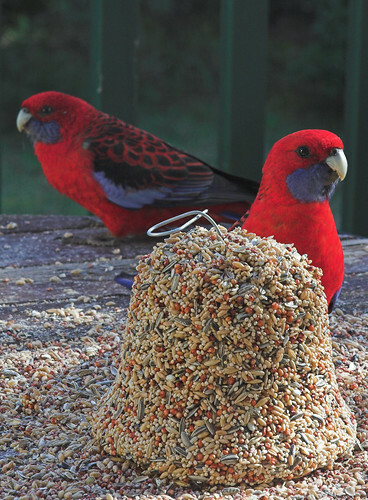 Cockies (and galahs - for some reason I've only ever seen one of those eating the seed we put out) will indeed dismantle houses and/or cars when they feel like it, but there are plenty of other feeders around Katoomba for them to visit, and we don't go away very often or for very long anyway. Two of the cats have no desire to go out at all. One goes out for a couple of hours of wandering about and looking ferocious every evening. He doesn't get far, has never to my knowledge killed anything with a spinal cord, and we don't let him out until the birds have all gone anyway. By "pot plants", of course, I meant "innocuous plants in pots". If it'd been the way YOU suggest, I would have dug out the weeds post haste :-). I really would love to live somewhere where you get birds like this running wild. Here, we're lucky to see a few starlings!